Thor the Warrior Kitten is not having any of what I’m serving this week. He looks like he’s laying blame, but I suspect his solution is for me to leave him alone. Hurt feelings are on my mind this week. Who did what, who said what, who can be trusted and who cannot? Maybe it’s leftover from the Scorpio new moon? I don’t know. But tender feelings and frustrations are on my radar. I don’t dig the place that line of thinking can take me sometimes. Doesn’t mean I always catch myself before I go there, but I always feel kind of crummy about it once I’m there. Every human being alive has been wronged–and wronged others. Ugly side effect of imperfection. So why do we get all obsessive about one or the other side of that equation? The Guilt Trip Express just never arrives at a lovely destination. If you find yourself hopping on the “how dare they” train, ask yourself, “Does it accomplish anything?” Because we have a finite amount of energy. I’d rather expend mine on moving forward than looking back. Next week, it looks like we’ll have some opportunity to put such resolutions to the test. I’m seeing themes surrounding allies and enemies, blame and solutions. Monday, Judgement Reversed: Who’s at fault? Don’t know. Don’t care. What matters today is fixing it. Take care of business and do what needs to be done. The laundry list of blame can be filled out another day if it’s even helpful at all. Priorities here are functional and pragmatic: damage control, moving forward, what comes next. Tuesday, Ace of Wands: Do what you can accomplish on your own, even if it’s just a little start. It’s a move in the right direction. Creative spark can steer you toward some interesting solutions if you’re open to the possibilities. Wednesday, Page of Swords: Be clear with your words to make sure your messages are heard. Say what you mean and all that. Boundaries are helpful. Do be aware of feelings–this guy can blurt at times. But still, don’t sacrifice the primary meaning by putting too many frills on the message. Kind, clear and matter-of-fact should work. Thursday, Ten of Swords: Ouch. That’s all, just ouch…Okay. Deception can come to light. I’m getting this like overhearing what was supposed to be a candid comment and it’s upsetting, not consistent with your previous understanding. Friday, Eight of Wands Reversed: Confusing day. Chaotic, mixed signals, crossed wires. Ground and regroup as required! Saturday, The Lovers: Seek comfort in the arms of another! Or at least in the company of those in tune with YOU. And hey, if that’s a party of one, so be it! 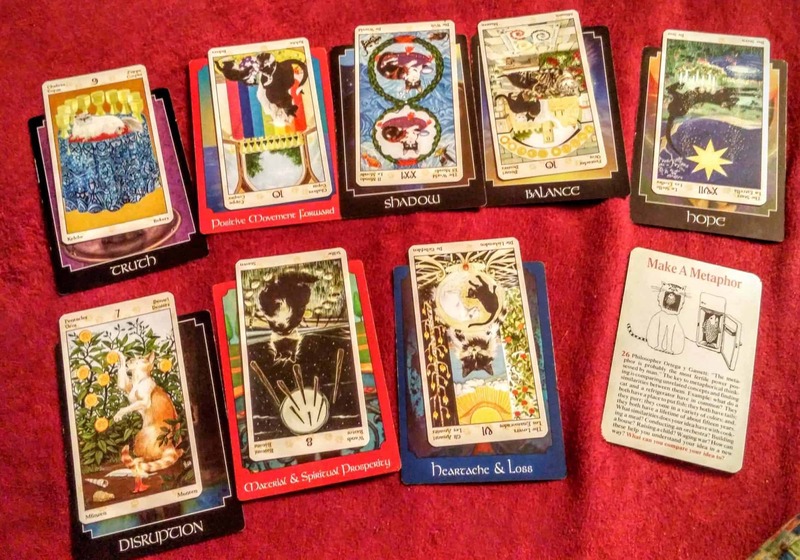 Sunday, King of Cups Reversed: Keep emotional floodgates locked down, lest you overreact. Feelings are not right or wrong. They just are. But post-meltdown regret can be very real. Reign it in, or nap it out. Overview/Advice, Strength: Okay, this is encouraging! It doesn’t take superhuman effort to stay on course this week. Just steady, guided pressure. You CAN do it. You merely need to remain fully present and aware. If you stay on top of yourself, the week will not get out of hand. Affirmation: Don’t fall in love with ideas. The same would go for perceptions, stories, worldviews, ideology, hero status, victim status, and miscellaneous convictions. Consider your “knowledge” a working theory and you’re on track. Be OPEN to what there is to see. Anybody else have hurt feelings on their mind? This week’s forecast features the Morgan Greer Tarot and the Creative Whack Pack. If you dig the forecasts, you’d probably like Dixie’s book. And you can always get yourself a private and personalized consultation. I was uncharacteristically fussy last week. Whiney even. Of course, I’m as human as anybody else and I can get stressed and fret. There’s nothing wrong with having those feelings. But I wasn’t shedding them as quickly and efficiently as I normally do. I was not letting go–massaging them and looking at them from every angle and in general, just working them way too much. Even I was getting tired of listening to me! Towards the end of the week, I decided to shift my focus. Enough already! The next day, the Universe tested me with a couple of vandalized tires crapping out on the way to a Tarot gig. I had even gotten up on time, damn it! I am proud to say I overcame the fussy and was able to go on to give some awesome readings the rest of the day. It wasn’t just what happened to me. It was how I was thinking about it. This week? A lot like that. Looking over the forecast as a whole, there’s unquestionably an edge to the coming week. There is a sense of tiredness here, and I expect some emotionally sticky moments without a doubt. I am thinking Wednesday will be the most challenging although throughout the week, it’s going to be vital to keep a tight grip on your perspective. In particular, don’t focus exclusively on what you feel is lacking. That’s a prescription of a sour mood if I ever saw one. Keep coming back to that thought this week, every time you feel frustrated. Ask yourself: Am I focusing on the lack? What do I still have? What can I be grateful for instead? See if you can shift your focus to blessings, to plans, to what you CAN do, what you DO have. If you take nothing else from this forecast, keep that thought in mind and it should carry you through! Monday, What to Let Go of in the Future – Emperor Reversed: That drive for control? Micromanaging–or rather, trying really hard to micromanage others via stunning wit or even your life via perfect planning? Totally not working. And you know it. If anything, it’s turning your hair gray and making you crankier than an old lady who hasn’t had her coffee. Let it go, Grasshopper. Let it go. Control is mostly illusion anyway. Tuesday, What to Take From the Past – Ace of Swords: Clarity, clean and sharp focus. I’m thinking of the 18-year-old about to graduate high school, full dreams and certainty. I mean, you sort of want to laugh in that fresh little face–so cute, all that certainty! (But you don’t laugh, because it’s mean.) The cluelessness, sure, we don’t need that. But that energy young people so often have, with such a singleness of focus, the drive and even to some extent even the idealism where things are so pure and simple? We could stand a little bit of that, even a long way south of 18. Wednesday, Crossing – Death: It’s not an easy time. That’s all. Big transitional energy that’s heavy and hard sometimes. That’s what’s weighing many people down. Understand it doesn’t last forever and be kind to your fellow humans because even if you’re not weighted, they might well be. Great day to purge anything symbolic of what you’d like O-U-T-out of your life! Scrape up the gook and dispose of it. Thursday, Heart of the Situation – Ace of Cups Reversed: All things appearing as bigger than they are due to emotional drain. Like those funhouse mirrors? Take some downtime if you can. Dream a little. Be kind to you. Friday, Surprise – Page of Pentacles Reversed: Details are less important than they may have initially appeared. Early day off work? Do be sure and track expenses, though, as we don’t want today’s surprise to be coming up short on cash. Okay? Saturday, Mind – Eight of Wands: I don’t know! Not me, as in Dixie doesn’t know. That’s what this card says, in the position of mind. It’s a mind not yet made up. Sunday, Romance – Five of Pentacles: There’s love available for you but you may not be feeling. If you need a hug, you will have to ask for it directly. Love and mind-reading are two different things. Make your desires explicit. Overview/Advice, Underlying Influences – Four of Cups: This is a week pitting experiences against expectations. It’s a little harder because it looks to be challenging to judge at points what is reality versus what is interpretation. I want to fall back on some of my old standbys: don’t date potential. Don’t expect other people to be you. Give yourself space to think, to grieve, to get quiet, and to know your own mind. Let emotions flow, to you and through you. If in doubt, nap it out. Affirmation: When I reverse the thought, I reverse the condition. That sounds like a load of Law of Attraction crap, doesn’t it? Ha! Well, this is from the Abraham-Hicks deck but y’all know me. I have mixed feelings about the Law of Attraction as is generally postulated in popular culture. However…your experience IS highly dependent upon your interpretation of it. Let’s say your car breaks down. Okay, that’s no fun. But whether it’s a world-ending tragedy or a minor blip in your life depends very largely upon how you think about it. So while changing your thoughts will not pay the car repair bill, they can move you from a place of victimhood to gratitude, that these are the kind of problems you have: solvable. In every bitter pill, there is some blessing. I’m not saying ignore the hurts and struggles. I’m saying don’t put them in the center of your life. Ground yourself in blessings and love, and let the struggles be but a small part of the overall picture. Okay? It’s all about the perpsective! This weeks forecast is using the mini Radiant Rider-Waite in a tin and the Deck of 1000 spreads, with some Abraham-Hicks affirmation cards. Want personalized guidance? Get yourself a session with Dixie, yo! p.s. My Tarot class is going on full blast. If you talked to me about joining previously and would still like to, please give me a holler quick. We’re definitely going over 2 weeks so I’m open to let a few more folks in if they fit with the group.